The 8th Word Wonder! Speech & Language Therapy Blog: FREEBIE! 1st TPT anniversary! Today marks my first TPT anniversary! TPT has truly changed my life, making me a better therapist, as it is unlikely that I would have put as much thought and effort into creating new therapy materials as I had without it. I love getting feedback from people who have purchased some of my products who share how my materials have helped them and their students. It truly is priceless. 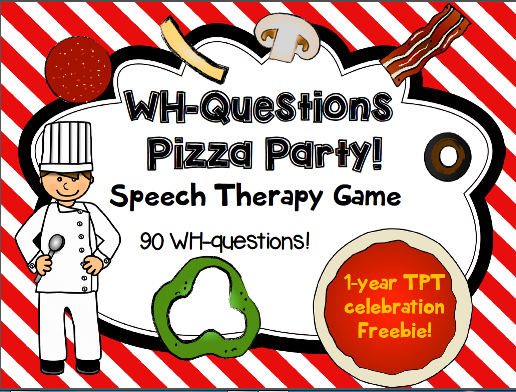 As a big celebration and "Thank you", I am posting a FREEBIE: WH-Questions Pizza Party!